Erected by the family in loving memory of their mother. Elizabeth Sutherland died at Edinburgh 7th August 1890 aged 32 wife of Adam Macleod. 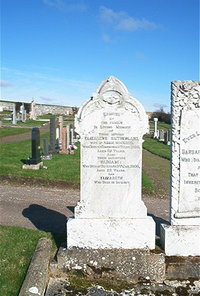 Daughter Margaret Sutherland died at Boultach 3rd January 1908 aged 22. Daughter Elizabeth died in infancy.